The patio in front of the gallery is soon to be graced with three giant works of art from the collection of works by The Pipe Brothers. From the Town of Danville: The Town of Danville and the Village Theatre Art Gallery invite the community to view the ceramic exhibition inside the gallery, Conceive Construct, Embellish as well as the ceramics exhibition on the front patio of the gallery featuring three pieces from The Pipe Brothers collection. The patio in front of the gallery is soon to be graced with three giant works of art from the collection of works by The Pipe Brothers. Vitrified clay pipes that stand seven feet tall and tell a story are sure to attract the attention of all that pass by. As part of the Mission Clay Arts and Industry program, each year artist travel to Arizona where the pipes are manufactured, where they work their artistic magic, changing the pipes from practical to beautiful. The selected pieces on view in this exhibition are all by the American fine art sculptor and mixed media artist Tom Franco which he created in collaboration with his Dreams Art Team, consisting of Heather Fairweather, Colin Hurley, Rayoliver Bacoy Del Mundo, and Iris Torres. The pipes will be on view in front of the gallery through December 2018. Franco considers himself a folk artist, and this comes through in his colorful and whimsical artwork. The large works on view are playful and invite the viewer to circle around and engage with them, to see, rather than read the story they are telling. People of all ages will find something to appreciate in these tall pillars of art. the arts. After graduating from Oakland's California College of the Arts in Ceramics and obtaining a Sculpture major from UC Santa Cruz, Tom co-created the Firehouse Art Collective in 2004. An Opening Reception for the artist will be held Thursday, May 3, 2018 from 5:30 p.m. to 7:30 p.m. Complimentary refreshments will be served and as always, this family-friendly event is free and open to the public. 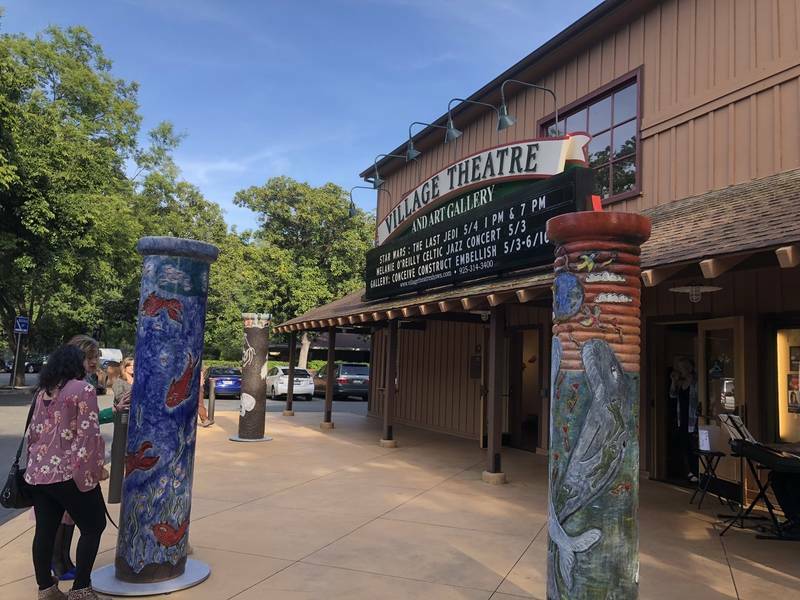 The Village Theatre and Art Gallery is located at 233 Front Street in Danville. The Gallery is open to visitors Wednesday through Friday 12:00 p.m. to 5:00 p.m., Saturday 11:00 a.m. to 3:00 p.m. and Monday and Tuesday by appointment only. The Gallery is always open one hour before performances in the Theatre. The Art Gallery is closed on Sundays. The outdoor portion of the ceramics exhibition will run through December. Tom Franco and Mission Clay owner Bryan Vansell. Photo by Alex Diana. Courtesy of Metric Cosmetics. An industrial factory that churns out giant clay pipes for municipal sewer systems may seem like an unusual place for artistic experimentation. Yet it’s one such site in Phoenix, Mission Clay Products, where numerous noted ceramic artists have created intriguing and unexpected artworks over the past decade. 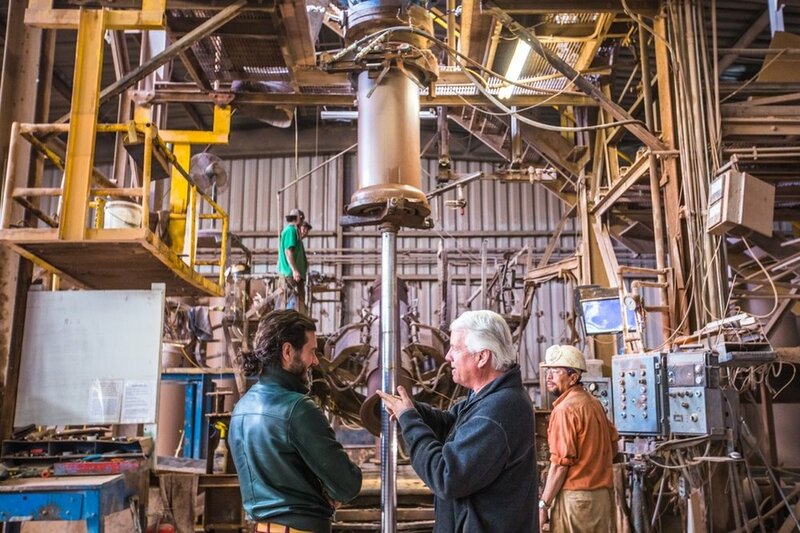 Two of the most recent artists to work with Mission Clay’s eight-foot-tall pipes is Tom Franco, a Bay Area artist, and his older brother, actor James Franco. Collaborating on-site in Phoenix and remotely, the Franco brothers worked together to create nine ceramic pillars that have been carved, painted, and fired. The works were then hauled into a gallery for a mostly whimsical, yet oddly attractive exhibition—we’re talking about sewer pipes, after all. The show, aptly titled “Pipe Brothers: Tom and James Franco,” debuted in mid-June at the nationally known Ceramics Research Center, an arm of Arizona State University in Tempe. The Franco brothers join an exclusive circle of artists who, over the years, have been invited to work at the pipe-fabrication company, which is tucked into an industrial corner of southwest Phoenix. Mission Clay makes more than 15,000 tons of vitrified clay pipe (VCP) annually, using locally sourced clay. The company originated in California before branching out to Arizona in 2007. Photo by Alex Diana. Courtesy of Metric Cosmetics. Under the leadership of Bryan Vansell, the company has also nurtured a program called Mission Clay: Art + Industry, which aims to offer an environment to foster artists’ creativity and inspire fresh ideas. For more than three decades, the company has welcomed artists to share space alongside factory workers, fostering dialogue and engagement between the two groups. In the 1980s, the Art + Industry program even held “Clay Pipe Symposiums”—festive weekend events with guest artists and panel discussions. The lineup included names like Tony Hepburn, Al Johnson, Judy Moonelis, Stephen De Staebler, Christine Federighi, and Ron Nagle. Sculptors Jun Kaneko, Susannah Israel, and Alan Chin also have a long association with Mission Clay. As for the Franco brothers, the venture into clay pipes sprang from a conversation with John Toki, the noted Bay Area ceramicist and teacher, who has mentored Tom over the years. Tom’s work has typically centered on paintings and found-object assemblages, while James has focused on large-scale paintings. Firehouse Art Collective Members. Photo by Alex Diana. Courtesy of Metric Cosmetics. As Tom recalled in a phone interview, Toki saw the Franco brothers’ work as a natural fit for Mission Clay. The prospect excited the younger Franco, who notes that Toki has a “huge fascination with progressing the ceramic arts.” Toki has long worked with massive proportions of clay in his barn-size studio. Today, he serves as the associate director of Art + Industry. Tom Franco traveled to Phoenix four times over the course of a year, accompanied by a team of four artists from the Firehouse Art Collective, a Bay Area network of affordable residential/gallery/retail spaces that he helped found. Sometimes working in extremely hot conditions in the vast factory, the team got a taste of the physical energy needed to work with massive towers of wet clay. The pipes are extruded from a 50-foot-tall machine and then carefully forklifted into the artists’ work area. Franco and fellow artists often worked on ladders, putting muscle into shaping, scraping, and puncturing the clay. The beehive-shape kiln area is bigger than a house, Franco estimates, and the drying, firing, and cooling process can take up to several weeks. Tom Franco at Mission Clay. Photo by Alex Diana. Courtesy of Tom Franco and Metric Cosmetics. Seven pipes in the show are Tom’s, while two are attributed to James, who submitted detailed designs and asked Tom and his team to bring them to life. James’s busy schedule as an actor, writer, and filmmaker precluded a trip to Phoenix. Most likely, his work will garner plenty of attention, especially the pipe called Jimmy (2017), which depicts the actor in a scene from the 2001 television movie in which he played James Dean. It includes Dean’s infamous Porsche. The other pipe, Harry (2017), bears an oversized, beatific feline, evidencing the actor’s known affinity for cats. Tom’s work has a flair for the narrative and includes figures, representations of nature, and fantastical elements; titles include Frog & Bunny Jump Rope(2017) and Outerspace Ships (2017). All nine pillars are 7 ½ feet tall—the pipes shrink slightly during the firing—and 18 inches in diameter. But what should not be overlooked in the “Pipe Brothers” show are selected works by four internationally known artists, all of whom have also taken up the challenge that Mission Clay presents. Toki is represented bySynchronicity (2011), a black-and-white pillar evoking Asian ceramics, alongside columnar forms made by David Kuraoka, Don Reitz, and Patrick Siler. The pipes on show range in weight from 750 to 3,000 pounds each and are arranged in the gallery according to which parts of the floor could safely support them, says Garth Johnson, the Ceramics Research Center curator. “Installing the show has been half the adventure,” he quipped on opening day (a time-lapse video captures the elaborate installation process, which involved cranes, gantries, and forklifts).